Your post brought about an interesting question for me today. For those who believe that we are who we are is based on evolution, what would the evolutionary pressure be for creating art? To answer your question, as you know, I like to express myself through music. Although, this time of year, a lot of creative energy goes into my garden. I love your art, Staci, and the message of communicating your thoughts through light bulbs. To create is to illuminate! Awwwww, thank you so much for your words of appreciation and encouragement Rob. I truly do appreciate it. Please have an amazing afternoon. I think that’s lovely, Staci. You know, I used to think I created from sadness and pain. But, that’s not actually true. I have finally come to terms with the idea that I don’t have to be depressed, in pain, or struggling with something “life altering” in order for a creative epiphany to occur. That’s great Sonyo. I definitely think that the creativity bug works especially well in sadness and pain, but it’s not limited to that, by any means. I also love great photography. Wish I was better at it myself. Writing is the primary way I express myself creatively. Oh that’s great Timi. I have that ‘divine’ way of creating when it comes to writing songs. They just come. With the words and melody and all. I have always loved to create: from writing poetry and drawing as a girl to songwriting, writing teaching materials, illustrating, sewing and even creative dress/personal style. I don’t feel recharged or like myself without something creative in the works. I have had a migraine for nearly 2 months and was housebound for one. Last week my best pain relief was coloring in a book. And I love that God made me that way. Ohhhhh, that’s wonderful. I wish I had found my creative streak earlier in life. At least now it’s there, and I’m loving it. So sorry to hear about the migraine. That’s rough. Two whole months? Ouch! I had many of them myself during both of my pregnancies. Not fun at all. Please take good care of yourself. Thanks. Yah it is a great discovery whenever it happens. Re the migraine – no not fun. I am taking care as much as possible haha. The boredom is tough. Heyyyyy Rosema, it’s so easy to see that your passion is creating through words. I’m so glad we met virtually. I also get inspired by songs and feelings. awww. thank you dear! i am happy to connect with you too! 🙂 sending sunshine your way, Staci! You write so well, and have a lovely heart, Staci. For me, creativeness helps me feel connected to others. Best sort is writing. Poetry. You’re so sweet Audrey. Thank you so much. –Like communication right ;-). That’s a great way of seeing it Audrey. If we were made in His image and likeness, then not only is the act of creating a huge part of us, but also the need for community and relationship. So glad to know you, and get the opportunity to read your amazing poetry. Hi Staci, I love to create with words! and the occasional coloring binge, with crayons! Ohhhh, that’s great. Love ‘the occasional colouring binge’. Do you use those adult colouring sheets/books that seem to have become quite popular? Yes, sometimes. But mostly, the $1 kids books! Wonderful sentiment and question – as always, Staci! I do believe we are creators, come from the Creator. But it doesn’t have to be artistic stuff per se. We can create new medicines, new laws, new standards, new way to do things, new machines, new inventions, etc. Outside of scribbling, I have no real artistic outlets. I can’t draw or paint or anything else. And if I didn’t write, I am sure it would come out in other ways. But I truly believe the innate desire is in all of us. We express a lot as children through art, but lose that passion along the way sometimes. But it’s still in there. Thanks for this – love it! Hey Paul. I completely agree with you. We’re not all ‘fine’ artists or ‘performing’ artists. But we all have the need to ‘create’. Whether it be with numbers, recipes, and all of the other things you mentioned. You know, I didn’t have a desire as a child to express through fine art of drawing and painting and stuff. At least not that I remember. I don’t remember much from my childhood. But I do remember not liking that area. Thanks a ton Paul. You’re the best. Please have a wonderful week. Hope the sun is starting to shine at your end. I believe that humans were born to create, like their creator God. I express my creativity through writing, but beyond that I also express my creativity through photography. 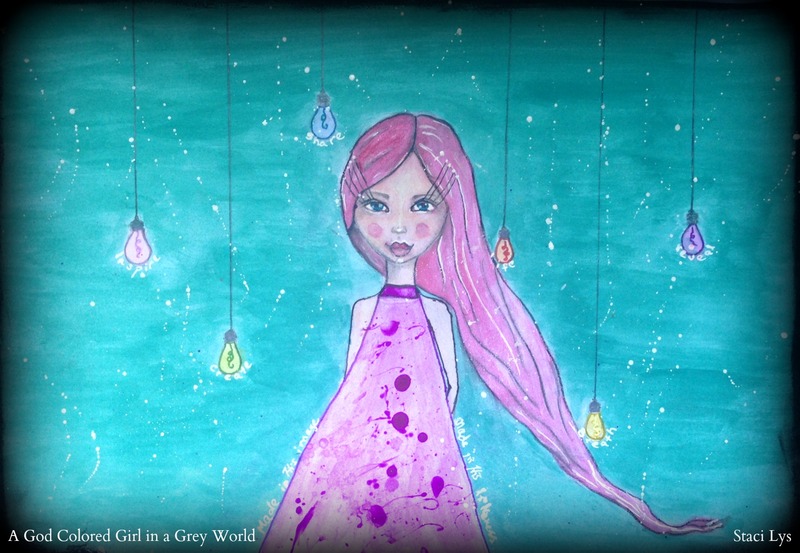 Great post and thanks for sharing your art as always Staci! Heyyyy Crystal. How are you? Great to see you here, and thank you for the comment. Oh yes, creating through writing and poetry. That’s wonderful. Thanks again Crystal and please have a lovely week. Hi Crystal. I also have been absent from WP for a while. Getting cooler here which means I go through some down times due to changes in the climate. Plus I was super busy with an arts conference here at our base and a House of Prayer that we’ve started here. Hope you are well Crystal. Here you are the sagacious Staci, I have been missing! Ohhhhhhhh, my friend Saaransh. It’s so great to hear from you. It’s been a while eh. Life gets busy, doesn’t it? Hahaha. It’s been a while for me too (cheesecake). Trying to lose a few pounds myself. Have a great weekend Saaransh. Thanks so much for this post! Creating is such an awesome thing, isn’t it? I am always so amazed at starting with a blank page and ending up with words from my head filling it up. I try and only publish the “good ones”. Ha! Thanks for stopping by! I hope it was worthy of your time!! Hey there Reluctant Poet. Yea, creating is super awesome. Love it. Oh yes, stopping by was worthy of my time. I’ll be by again for sure. A good thought here, loved reading it. Thank you so much Moushmi. I hope your week has gotten off to a good start. Oh that’s wonderful Alok. I completely agree. It is an amazing gift. Awwwww, you are sooooo kind Lorrie. Thank you so much Wendy. Please have a wonderful weekend. this is indeed amazing and powerful post,,,creative! Awwwww, thank you so much Mihrank. I’m so glad you enjoyed it. Hello Staci! I believe we do have an inherent need to create. I love your artwork. The blue in the background is so beautiful and soothing. Awwww, thank you so much Vashti. Have a lovely week, my friend. Ohhhh, you’re not the only one, my friend. I have been very absent from WP for about a month or so. Just starting to wind down here in my life so hopefully I will be able to spend more time here. Nice to know. And thank you for sharing here. I would like to think my inspiration comes from God. Since he is the most amazing artist and the creator of everything I believe he’s also my largest influence. Thank you for sharing your art and ideas. Very inspirational. Please have a lovely evening.